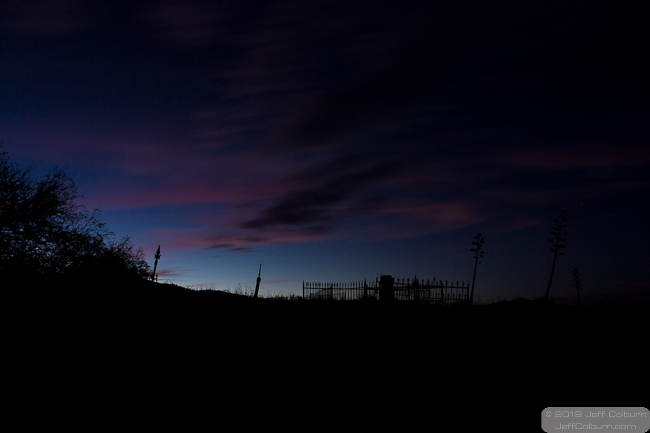 This shot was taken just after sunset at the Hogback Cemetery in Jerome, Arizona. The two spiky things are part of a fence around a grave, and to the right is a fence around another grave. This is a pretty cool graveyard, containing people from the town, miners and even a person who fought in the Spanish American War. There are graves with no markers, or simple wooden crosses, while others have sculpted stone markers. Not all graves are marked, so there’s a pretty good chance that as you walk on the paths, you’re walking across more than one grave. If you haven’t guessed, I love to visit old graveyards. If the weather is warm when you go there, keep an eye out for rattlesnakes.